Man and nature have always shared a unique bond. Gardening is a skill and an art. Gardening has been known for keeping us physically and mentally alert. It is also an interesting hobby and a time for family bonding. We shared about digging, weeding and pruning under horticulture therapy earlier. Today, we look into the safety factors to bear in mind to ensure a healthy garden. Top up on the liquids – It is good to consume water on a regular basis when working outdoors. If water is not an option, you may also consider alternative liquids that are low in sugar and alcohol levels. Protect your skin – It is recommended to take frequent breaks in a shaded area. Use this time to replenish on sunscreen to protect the UV rays and insect repellent to protect yourself from insects and bugs. While gardening brings with itself a host of health benefits, those with pre-existing conditions such as diabetes and heart conditions should careful not to overwork themselves. The heat from the sun can take a toll on our bodies and may cause dizziness and headaches. Should such symptoms arise, it is best recommended to halt the activity and take good rest. Does it sounds fun to some get your hands dirty while involving your younger family members? it is also important to take necessary precautions beforehand and during the activity. Here are a few items to include in your to-do list when it comes to gardening. Get Vaccinated – It is important to get vaccinated against diseases that plants and animals may spread to humans. Some of these diseases such as tetanus/diphtheria (Td) require a vaccination at least every 10 years. Tetanus is virus that thrives in the soil and enters the body through open skin wounds such as cuts. Gardening involves the use of sharp tools to prune plants. 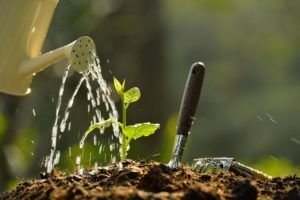 Gardeners often also use their bare hands to dig in the sand and during weeding, they may cut themselves when they handle the roots of plants. Such activities exposes a gardener to a major risk of contracting tetanus infections. To sustain immunity, you may take boosters at regular intervals after consultation with your healthcare provider. Wear gloves – It is good to have your body covered during gardening. Plants, soil and fertilisers may contain chemicals and microbacteria that harm the body. Direct contact with the skin, particularly in the presence of open wounds may result in severe skin infections especially for people with sensitive skin. Leather gloves are more rugged in mature and provide more protection as compared to plastic materials. Read instruction labels carefully – When operating gardening equipment or products, be sure to read and fully understand instructions before using them. Using the wrong products in particular chemical fertilisers could be harmful for the plant or even yourself if you consume what the plant produces. Just like you would like a cosy home, your plants would also like a good environment to grow in. Hence as a gardener, it is your responsibility to provide a conducive space for your plants to blossom. A diseased plant may spread and ruin other plants as well. Water – While the amount of water may vary slightly from plant to plant, a rule of thumb is to pour just enough water to wet the soil. As a golden rule, water should not pool above the soil. Excessive water will collect under the plant, particularly if you use a dish under the potted plant and provide a perfect breeding ground for mosquitoes. Holes in the Pot – Ensure that the pots have holes at the bottom. Not only does water seep through such holes, it also allows the roots to access some fresh air. However, be sure to check if water is collecting below the pot and clear it out frequently. Right plant, right place – Plants need adequate amounts of space, sunlight, air and water. It is vital to ensure that they planted in aptly-sized pots, placed in the right place and given access to adequate amounts of sunlight and air. Your garden can keep you healthy! Check out our online articles on how your silver years can be the prime of your life and Choosing your Sunscreen. The lifestyle section of PRIME magazine shares more !